A few weeks ago I got asked to write a short tutorial on how to insert/replace sky elements in pictures. No matter if photo or painting. It was on rather short notice and a tight deadline. Especially when there were other things planned already. Nonetheless I sat down and tried myself on it. I used the render plate I had from my “Hadley’s Hope” project. So it ultimately became sort of an alternative take on my original project. I worked pretty rough though since there wasn’t much time for a too detailed approach. Anyways… the short tutorial in the magazine covers how to place a nice sky, that complements the cityscape, into the scene. It’s partly manipulated with photos and partly painted. I had a more photo manipulated approach at first but the magazine requested more painted parts. I hope I managed to cover the basics about it. At this point I also have to thank Adam Smith who had the bad luck to edit my gibberish. =D He was quite a help. 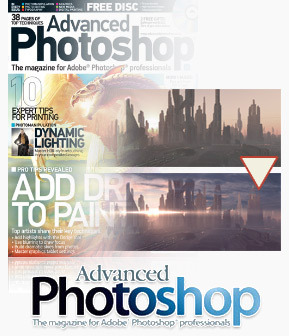 Advanced Photoshop Issue #90 is available now! Check it out! This entry was posted on Thursday, December 1st, 2011 at 14:28	and is filed under General, Publications. You can follow any responses to this entry through the RSS 2.0 feed. You can leave a response, or trackback from your own site.